With a wide range throughout Asia, Korea, and Japan, Lilium dauricum was used extensively in early hybridizing both in the US and Europe. An easy subject in the garden, it enjoys a well drained and slightly acidic soil. 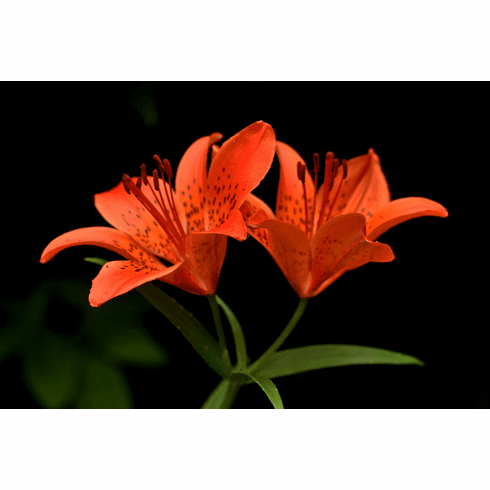 Ranging in height from 12 to 30 inches (30 to 75 cms) flowers are virtually unscented and open in mid to late June. Seed ripens in September and is immediate hypogeal in germination. Used by de Graaff in his 'Mid Century Hybrids', the spotted up-facing, orange to orange-scarlet flowers are believed to have been used in Japan 300 or more years ago in hybridizing. It is possible that this species has offered more to today's Asiatic hybrids than any other of the Asian species. There many variants of this lily, and found ranging even through Eastern Russia, it may well hold untold future breeding potential. Photo inset #1 is of wild plant taken by Dr. Nick V. Kurzenko near Kiparisovo village, Primorsky Territory, Russian Federation on June 22 of 2003. Photo insert #2 was also taken by Dr. Nick V. Kurzenko near Minamihama, Hokkaido (Japan) of wild growing plant. Public domain photo CalPhotos.